Jamaica’s Prime Minister Andrew Holness addresses the 73rd session of the United Nations General Assembly, at U.N. headquarters in New York, United States yesterday. 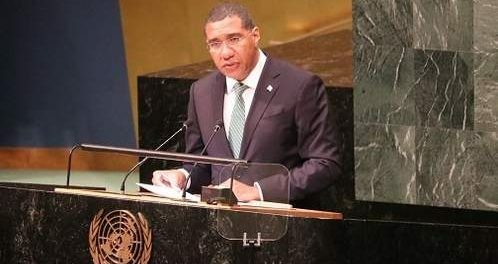 Prime Minister Andrew Holness yesterday reiterated the call by Jamaica and the rest of CARICOM for the United States to lift the embargoes imposed against Cuba almost six decades ago, arguing that societies function best within an inclusive global environment, where no one feels left behind. “Implementation of the SDGs (sustainable development goals) must be people-centred. Embargoes and other financial and economic barriers must not become tools to prevent people such as our neighbours, the citizens of the Republic of Cuba, from attaining their right to development. Jamaica continues to call for a lifting of the embargoes against that country,” he told the United Nations General Assembly in New York, US. In 1957, Jamaica, under the leadership of Premier Norman Manley, became the first non-independent country in the Western Hemisphere to impose unilateral trade sanctions against South Africa. This was in the wake of the institution of apartheid by the racist South African government in 1948, a position that was maintained by succeeding governments. In December 2010, Prime Minister of Jamaica Bruce Golding used his position as chairman of CARICOM, on the occasion of the 38th anniversary of diplomatic relations with Cuba, to urge the United States to lift the sanctions. Jamaica, Barbados, Guyana, and Trinidad and Tobago established relations with Cuba in 1972 despite protests by Washington. Since then, several other CARICOM countries have established diplomatic relations with the communist country. “We in CARICOM have long considered Cuba an important regional and hemispheric partner and an important element in our diversity,” Golding said then in a statement. A year later, CARICOM renewed the call as Cuba promised never to forget the role played by the four Caribbean countries in establishing diplomatic relations with the communist state 39 years earlier. Then CARICOM chairman and St Kitts and Nevis prime minister, Dr Denzil Douglas, told the fourth CARICOM-Cuba summit that the regional grouping was using the occasion to reiterate its call for “the United States to heed the overwhelming call of the members of the United Nations to lift, with immediate effect, the unjust economic, commercial and financial embargo imposed against the Republic of Cuba”. Then Cuban President Ra?l Castro told the opening ceremony that Cuba would also “never forget” the support of the Caribbean to put an end to the trade and economic embargo “imposed against our noble people by the United States government more than five decades ago”. Washington imposed the embargo in October 1960 in response to a decision by the late Fidel Castro, who came to power as president by overthrowing dictator Fulgencio Batista in a military coup on January 1, 1959, to nationalise the properties of United States citizens and corporations.